Blogging about all things that surround "beauty" for almost five years now, has meant that I've spent a fair amount of time researching the in's and outs of skincare. I'm not a pro by any means, but after trying a vast amount of products and reading into what works for others, I've picked up a fair bit of information and tips- be it advice from the industry professionals, or from like minded individuals, all with a skincare story. A few causes of Acne are hormones, stress and bacteria. Dirt doesn't actually cause acne or spots. However clogged up pores do. It might reduce the look of your acnes Redness (temporarily), but being in the direct sunlight tanning could actually cause you further damage due to the extra oil production your skin will quickly get to work at making. 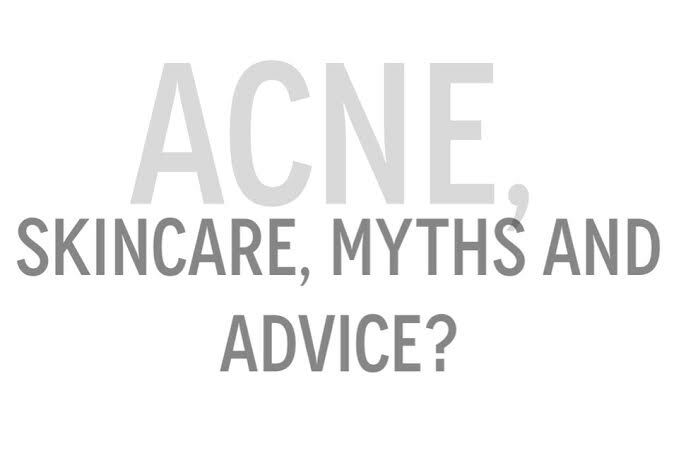 Acne doesn't dry out. Skin isn't meant to dry out. Instead, wear a facial SPF suitable to your skin type and enjoy the sun safely. I did this once at school, and it didn't work. I actually remember waking up to an even more Red slightly burnt feeling spot. I'm pretty sure that goes for Sudacrem too *zips the nappy bag up*. A few causes of acne and spots are hormones, stress and bacteria- not make up. However, make up can clog pores up and bacteria can be spread via make up brushes/fingers. That bacteria = potential problems. So many times I've heard of people not using oily/moisturising products on their oily skin because "it would make it more oily"-all skin needs moisture- even skin suffering with acne/spots/oily zones! I've personally never suffered with severe Acne or any major skin problems, but unfortunately for them, I have friends and family that have suffered with various skin conditions and Acne on quite a severe scale. Since back when we was at school to the present day, I have seen first hand how much it has affected some of my closest friends. I see how down they can be when they have big break outs, and I see their mood brighten when their skin begins to clear up due to either prescription medicine or their regular skincare routines and that's the way it's been for years. As I'm pretty involved in make up, skincare and the surrounding fabulous things, it's something we discuss on a regular basis and I would really love to further that conversation with you guys. The internet and friends are my first call for any advice and I would absolutely love to hear all of your skincare tips, advice, myths and stories in the comments below and hopefully, they can in turn, help others too. The method that I use to remove my make up really affects my skin. If I just use make up wipes I am more prone to breaking out than if I properly remove all of my make up then moisturise after. My diet affects my skin too. Greasy food might not cause acne but if I was to eat packets of crisps everyday my skin would be terrible. Drinking loads of water and eating plenty fruit and veg definitely helps in the long term.